I chose to basically become an animal for one day, or at least communicate like one. I realized that knowing how to speak in the same language as the person you’re talking to was a huge advantage. Sure, body language and gestures may get your point across, but it tends to lead to misunderstandings, frustrations, and awkward moments. My experience reminded me of the Tower of Babel affair and the reason the tower was never completed. Once all the laborers spoke different languages and couldn’t communicate with one another, the tower became a disaster. I found that not being able to talk meant I was often left out of conversations and I was able to slip away quickly and quietly without anyone noticing. If I wasn’t with a group of friends, I would go unnoticed. It was as if I had lost my “voice” in this world. And I basically did. With my voice removed, I learned from this exercise that if I didn’t speak my mind, get my ideas across, reach out to people, it’s really easy to be brushed aside. Another side effect which I found interesting was that when I did make sounds, the sounds tended to be contagious. My friends around me would also start acting silly and bark or meow back and soon we would just become a band of animals. After the whole experience, I thought it would be really funny if this way of communicating could really become another “language”. 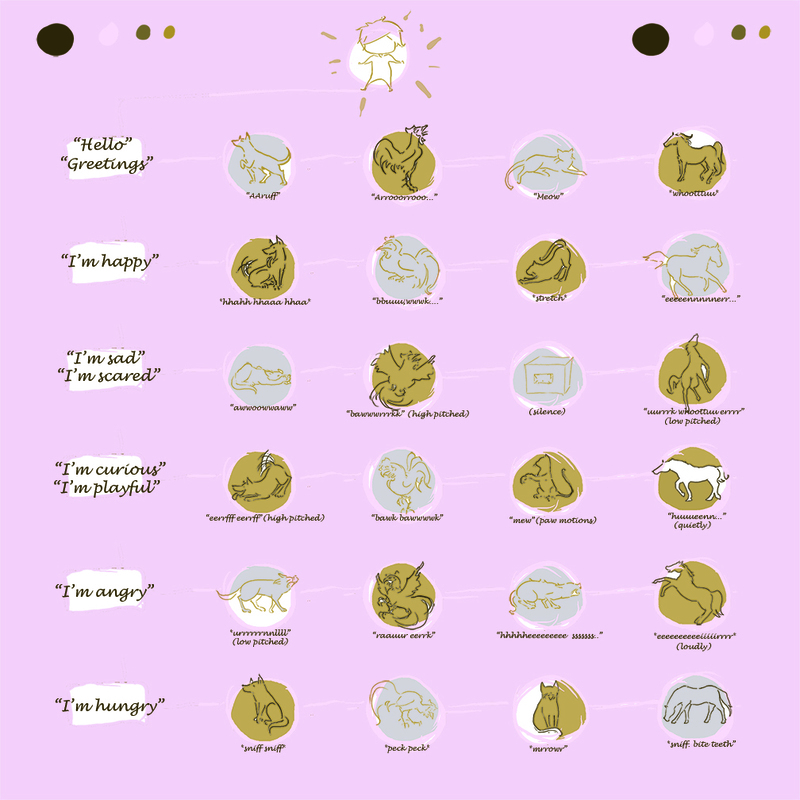 I created a spreadsheet/instructions manual to teach other people how to “talk in animal” so they would be able to understand my “language” as well.